Better than 1080p, this super high definition Four Camera 4MP Dome IP Camera System will provide video that is double the resolution of HD 1080P. The included 4MP dome security cameras provide a clear image that's twice the clarity of the best 2MP security camera. You can expect facial detail up to 50ft away in daylight, and 35ft away in night time. Don't worry too much about the weather. With an indoor/outdoor IP67 weather-proof rating these cameras will stand up to some of the harshest conditions. There is also 100ft of night vision provided by the camera's infrared LEDs. The vandal proof metal dome design makes these cameras difficult to disable by vandals. This IP Surveillance System comes with its own storage and will record real-time footage for later review. Just mount your cameras and plug them in to your NVR. The 4 built in Power over Ethernet (PoE) ports will both power and transmit data to and from the cameras. No time or money wasted on extra tools, parts, or cable. You'll be on your way to enjoying the comfort that your property is protected in no time, whether you're home or on the go. 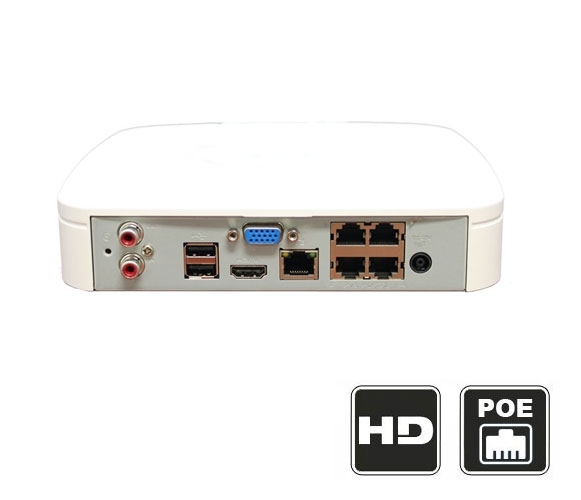 Setup is very easy, just like all of our PoE IP camera systems. Just mount your cameras and plug them in to the NVR. One CAT5 cable per camera will both power and transmit data up to 300 feet without a repeater. You'll also see up to 100ft in the dark due to the infrared LEDs on the camera that provide night vision. After a quick configuration you'll be viewing your IP cameras from anywhere. How many PC’s on internal net work can view the cameras? And how much bandwidth will be used if 6 different PCs are viewing. The NVR supports up to 5 simultaneous user connections. All 5 users can view all 4 cameras as long as they using the substream which is roughly 1mbps per camera. You would need this PoE extender for each run.